The playground of Hong Kong International School Upper Primary School is located on the 7th and 8th floor. It unites the traditional culture with abundant play value. The most attractive play equipment in the playground is the 6.3 meters high Chinese Lantern-shaped climbing equipment. It contains ropes, nets, hammocks which provide an excellent climbing challenge for children. The Lantern also connects 2 floors by a suspension bridge, students can garner the excitement while crossing the bridge. Another climbing equipment is next to the Lantern which is imitating the famous Bun Scrambling Contest. Students can race against each other for ringing the bell on the top of the “Bun Tower” just like the Bun Scrambling players. The Scaffolding Climber is a vertical climber which lets children climb from the 7th floor to the 8th floor. 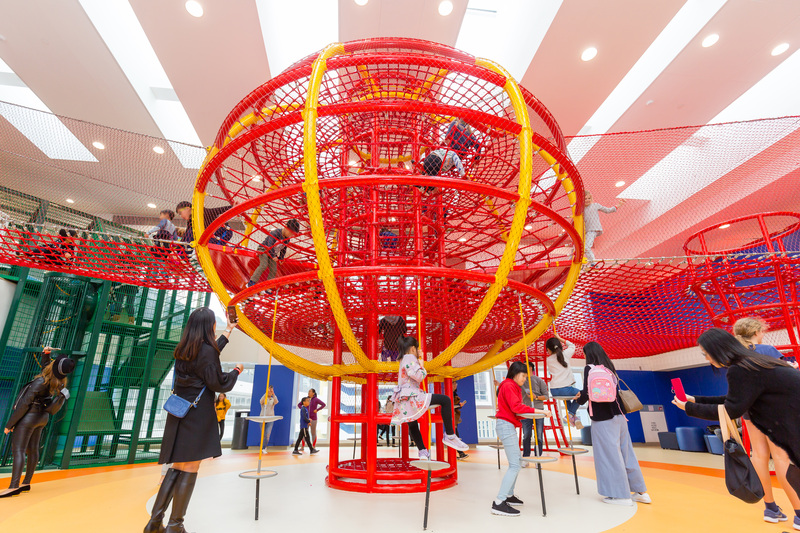 On the 8th floor, there is a circular Bamboo Climber which children can climb on ropes and pillars. Besides the climbers, there is a thrilling slide which is 2 floors high. Also, the playground is installed a “Pachinko” Wall where students can play ball there.